There’s a temptation when writing in Scrivener (or a word processor) to press the Return key twice at the end of a paragraph to give it that nice, visual break. Problem is, when you’re setting up your manuscript for submission or publication, those extra lines leave big gaps. To avoid the temptation, make sure you set your default format to have at least 12 points after the paragraph. This setting is accessible under the Line Spacing drop-down in the format bar by clicking Other. But that only helps you from here on out. Sure, you can clean up those extra lines in your word processor after compiling, but what if you’re trying to create an e-book? If you’re currently stuck with a manuscript with an extra carriage return after each paragraph, here’s how to fix it. Alternatively, Mac users can right-click (Control+click) on the text box in the Project Replace window, click Insert, and choose the desired non-printing character from the list. 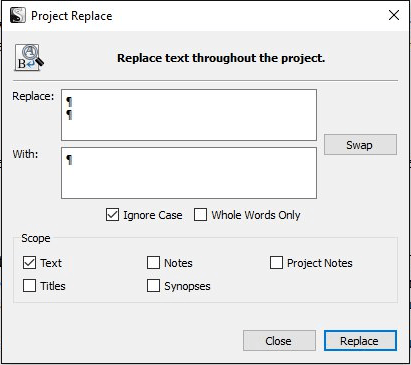 Finally, the Windows version of Project Replace can handle non-printing characters (as of 4 August 2016)! To eliminate extra paragraph returns in your entire manuscript, do the following. 1. Go to Edit—>Find—>Project Replace. 2. In the Replace text box, press Option+Enter (Mac) or Ctrl+Enter (Windows) twice. A pilcrow (paragraph return) character appears for each time you press the key combination. 3. In the With text box, press Option+Enter (Mac) or Ctrl+Enter (Windows) once. You've just set up Scrivener to find all the double paragraph markers in your manuscript and replace them with a single paragraph marker. 5. Click Replace. NOTE: Once you get through step 6, this cannot be undone and applies to the entire project (unless you chose “Selected documents only”). 6. Read the warning and if you're confident that you have everything set up correctly, click OK (Mac) or Yes (Windows) to proceed. A bar at the bottom left of the window displays the progress. The replacements might take a few minutes if you have a lot of them to work through. 7. When the bar reaches the end (Mac users will receive a notice showing how many documents were changed), click Close to close the Project Replace window. You’ll want to take a quick look through your documents to make sure Scrivener didn’t miss any extra lines. Turning on the invisible characters (Format—>Options—>Show Invisibles) makes it easy to check for problems. A miss might happen if you inadvertently put a space or tab character on the blank line (second paragraph return line) without realizing it. Mac users can hide the invisible characters by going to Format—>Options—>Hide Invisibles. Windows users, return to Format—>Options—>Show Invisibles to remove the checkmark. I’ve wondered about this, and it might explain why when I copy and paste some of my blog entries from Scrivener to WordPress there are huge gaps. So far, I’ve simply corrected the error in WordPress by hitting the delete button to “snug up” the paragraph breaks. I’ll try this and see if it fixes the problem from the source. Thanks, Gwen. I always learn something from your Tech Tuesdays. Sarah: On a short document with only a few paragraphs, it’s probably easier to just delete the extra paragraph lines, but I’ve had some people asking about it that had full manuscripts of 100K or more! That would be a chore. 😉 Thanks! Gwen it’s really scary how timely your Scrivener posts are! You seem to be looking over my shoulder LOL! I was just preparing to look in your book for how to do this very thing! I occasionally cut and paste and end up with different formatting, so paragraphs indent different # spaces and have different spacing -is there a short cut to fix this? CristineGzr: It’s actually not in my book, but I’m glad it’s timely. 😉 To avoid a mish-mash of styles when pasting, use Edit–>Paste and Match Style, instead of the standard Paste. It won’t solve extra carriage returns because those are like text, but it will take care of font, indents, line spacing, etc. Under the Windows solution, #5 – there is a mistake. The extra spaces in copying text to WordPress have nothing to do with double spaced returns in Scrivener. I never double space paragraphs in Scrivener or any other word processor, but WordPress often adds the extra spaces, which I have to remove manually. Catana: You’re right. 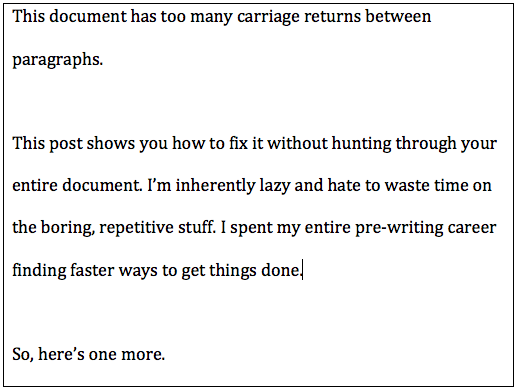 I usually notice it when I paste my blog post back into Scrivener after making edits in WordPress. Thanks for stopping by! Ah… Thanks, Catana. That saves me from messing around too much with Scriv. formatting. And actually, when I turned on Show Invisibles, it appears I have only one carriage return. I guess it’s just the delete button to format in WordPress… unless anyone else has a bright idea. Sarah: Hey, a real picture of you! I like it. 🙂 You could try using Edit–>Paste And Match Style when you paste into WordPress. Even with the less graceful workaround for Windows, I’m delighted to have this knowledge. I wondered what in the WORLD all those random line spacings were when I printed my first draft of my novel. In Scrivener they look pretty normal…Very useful, and very clearly presented, thanks as always, Gwen. vst3in: I’m glad the post was helpful. Thanks! Am I the only one who formats my eBooks in block paragraphs with an extra space between paragraphs? When I used to indent my paragraphs, I found that on previewing, the Kindle would not recognize any indents that fell at the top of a page and instead made it block, which looked like a continuation of the previous paragraph…particularly troublesome if it was dialogue and another party is speaking. That’s when I changed to block with an extra space (or 12-point). Bettye: I actually prefer block format too. You can still have that without having to add extra carriage returns though. Just click the Line Spacing button, choose Other, and set the After Paragraph value to double your output font size. So if you’re going to compile to 12pt font, use 24pts to get the equivalent of an extra line between paragraphs. Hi Gwen, thanks for this article. I actually have the opposite problem. I often post my stories on a private phpbb discussion forum for feedback. I WANT the double hard return for posting online for the same reason as Bettye, that pure digital text often doesn’t recognize the paragraph indentation. Setting the “after” spacing for paragraphs in Scrivener makes it appear like there is space after the paragraph in doc, rtf, pdf, or preview… but the space isn’t actually there when you output to plain txt or try copy pasting. How can I set up a compile profile that inserts the double-enter for plain text output, but not for others? Are you using the Mac version? If so, when compiling to plain text, select the Transformations tab in the Compile window, select the check box next to Convert To Plain Text, and choose the desired elements from the drop-down menu (e.g. Paragraph Spacing). Unfortunately, the Windows version doesn’t yet have this option. Soon, I hope. Since you export to plain text frequently, you can save your compile settings for future use. There’s more in this post: http://gwenhernandez.com/2010/04/06/tech-tuesday-saving-compile-manuscript-settings-in-scrivener/. Okay, I copied and pasted these instructions in my Scratch Pad for future use, because I’ve been facing this problem. Up until now I solved it by copying and pasting the style format from paragraph that was not double returning to ones that did double return. Thanks for posting this. Also, your book is very handy for learning more about using Scrivener. So, to remove the “double tabs” in word, do the following: Find/replace all the tab character with nothing. This will remove ALL tabs in your document and you’ll probably scream thinking you ruined your formatting. Wait. It will work. I promise. Then, select all text (control A), click on the “paragraphs indents and spacing” on the ribbon bar, then select “first line special” by .5 inch, then click OK. All paragraphs should now be indented by one tab and you can re-import into Scrivener. I recently discovered your site and book. Amazing! 🙂 I still can’t find the answer to my question. After compiling, is it possible to remove the additional space between docs under a folder? I know I can merge the docs to get rid of the space but I want to retain my outline. Hope to hear from you. I’m very late to the party, but I was looking for a solution to the problem of tabs from another program interfering with my paragraph indents. I can’t find any mention of how to use invisible characters in Find in the Windows version, but I found my own workaround. JIM!!! You just saved my night!! Nothing was showing up when I pasted but I hit next and figured out that it was really there!! I hope so Gwen. Scrivener is completely awesome in any form. Hoping for Scrivener 2.0 for windows this year! This is awesome. I had figured out how to delete the extra spaces, but not how to have them in scrivener but not compile. Thanks!! Gwen, this is a very good tip that really helped me the first time I found it here. I enjoy your helpful postings, and came here again to this topic today Googling for an answer to how to do find and replace in one Scrivener document and not the whole project. When I saw the comment in this thread about WordPress adding extra spaces I remembered how that used to plague me until I found a workaround. If I copy and paste text from Scrivener first into a plain text editor (e.g. TextWrangler, TextEdit) then copy and paste it from there into WordPress no extra spaces are there to be removed by hand. Hope you can point me to answer how to find and replace in one Scrivener document. I am trying to change all double quotes to single quotes in one document in a Scrivener document and not in other documents in the same project. That was quick! Many thanks, Gwen. Hi, thanks so much! I have an issue though, when I replace the two paragraph symbols with one (on a mac) I have no line breaks (of course, that was the point) between paragraphs, but it didn’t automatically create indentions as I thought. Anyway to change the web-formatted (line break between paragraphs) with indentions only? Alec: You have to set the indentations separately. This post talks about how to set up your defaults and then apply them: http://gwenhernandez.com/2011/03/29/tech-tuesday-formatting-tips-for-scrivener-2-x/. To set the first line indent–which is what you’re talking about–adjust the location of the little bar (Mac) or the downward-pointing triangle (PC) at the left end of the ruler. So once you have your defaults all set up, the process for pasting in future text would be to eliminate the double paragraph returns and then apply your default formatting. HTH! Hi Gwen, you´re posts are amazing, and the book “Scrivener for dummies”…I hope it arrives to my address very soon. I need your advice in something, is about the indents. How can I change the indent for the paragraphs from 0.50 to 0.25 inches, in the whole manuscript (project)? Mine is 178,000 words. I will appreciate your help in this. Thanks for your time. I just started with Scrivener and I’m getting the distinct impression that it hasn’t yet managed to reconcile formats used for traditional publishing (MS Word) with formats used for ebooks (epub, mobi, HTML, etc.). Near as I can tell, if you want Scrivener to output your paragraphs correctly into a digital publishing format, you NEED to use a double-enter for a paragraph break. I’m new at this and I could be wrong, but if there’s another way of doing it I’m not sure what it is. Thad: The reason it looks like that with ebooks is because the formatting is set up to have no after-paragraph spacing. I leave mine like that and add in first-line indents, but if you want more space between paragraphs, you can adjust it on the Formatting tab of the Compile window. Make sure you’ve selected the text row in the upper table, then click on the text in the editor below, choose the line spacing menu on the little format bar, and select More (or Other). That’ll give you a box where you can add after-paragraph spacing. Thanks; that helps. It’s still a problem for exporting to plain text or HTML, but it works okay for epub etc. I’m new to Scrivener and I expect I’m coming to it from a much different perspective than most people; my background is as a programmer and web developer, and I like being able to output documents as clean, easy-to-read plaintext, or HTML that you can easily pull up in a browser. It seems to me that Scrivener is really only suited for those formats if you DO add double line-breaks, which is unfortunate. Maybe I’ll go see if there’s already discussion on this topic over at the official forums. Gwen, I’ve been searching for the issue I’m having when I import a Word manuscript into a new Scrivener project using the Import and Split. Many of the end dialog quotes are made into ”” instead of the curly quote (smart quote). Have you seen that before? I looked at the section in your book and in the user manual, but didn’t see it mentioned. 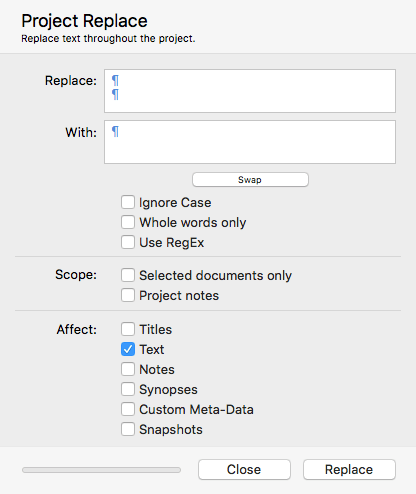 daniellelenedavis: Not sure why it’s happening, but you should be able to do a project replace (Edit–>Find–>Project Replace) from “” to “. Then, you can use Format–>Convert–>Quotes to Smart Quotes. If you are going to import a lot of Word documents, you might take a look at the Import converters in Scrivener–>Preferences (Mac) or Tools–>Options (Win). Hope that helps! Thank you, Gwen. It helps. As a previous poster noted when running the Linux version your windows workaround really messes ups. In fact , the first paragraph in every scene gets changed to a centred style of justification… yuk! What I have found as an alternative method is to go to an OpenOffice version and search for paragraph marks. This you must do by ticking the box for ‘regular expressions’ and inserting ‘$$’ (two successive paragraph marks). You can do a similar thing in MS Word. Thanks for sharing, Geoffrey. I have no experience with Scrivener running on Linux, so I appreciate you providing some alternatives for those users. You should warn readers not to take step 6 lightly. THIS CHANGE CANNOT BE UNDONE. I write poetry, so hitting a hard return after every line is a necessity, and two for a stanza break. However, Scrivener was adding even more space during Compile. That’s what I wanted to remove. However, this method removed extra spaces for stanzas. I cannot get them back. I reverted to a backed-up version from the previous night, but apparently Scrivener does not make this change in the document itself, it makes it in some settings file somewhere, not in the backed-up project file. Now all of my poems lack stanza breaks. Any suggestions on how to do this? The current draft has about 100 pages in it. David: Scrivener does warn you, but it’s probably easy to miss what that means in the moment. I’ll add a warning here too. For future reference, if Scrivener is changing something when you compile, then the place to fix it is in the Compile window, especially the Formatting tab. Some compile formats add after paragraph spacing, first-line indents, and so on, but that can all be changed. A backup version (or copy or anything) should not be affected by changes you make in a later version. Paragraph returns are just non-printing characters, not some special setting. Have you tried any of your other backup files? If you don’t have the date/time added to the backup file name, Scrivener just rotates through #1-5 in order and then starts over, so backup 2 might be newer than backup 5, so it’s easy to get them confused unless you look at the date/time column in your Finder or File Explorer. Even if you can’t recover all of the poems you had, you might be able to get most of them in their previous format, and then you’d only have to add extra paragraph returns to the most recent ones. Good luck! Such a lifesaver! Thank you, Gwen! OMG thank you so much! I have become so frustrated with the automatic indents for new lines and now it’s solved! Hi, Jennifer. If you’re not manually inserting tabs, you’ll still get indents if the default formatting is set up that way. You might find this post helpful: http://gwenhernandez.com/2011/03/29/tech-tuesday-formatting-tips-for-scrivener-2-x/. Just set your default format not to have indents (drag the first-line indent bar to zero inches on the ruler), and apply to any existing documents. HTH! Can this be used to remove the blank line at the end of documents? It doesn’t look like it, unfortunately.